Valentino Donna is the Valentino Creative Directors feminine interpretation of when fashion meets fragrance through an artistic inspiration of Italian cinema. The graphic architectural shape of the bottle made of studs is inspired by the edgy fashion code and evokes modernity and heritage at the same time. Rose essence, generously blended with notes of bergamot and iris Pallida, illuminates the fragrance with refined radiance and an impalpable texture. Warm, intense notes of leather blended with patchouli and vanilla express an exquisite, inescapable carnality. 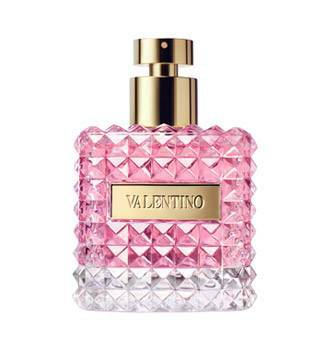 Valentino Donna is mysterious, exquisite and timeless, like a couture object. Luminous and sensual, the fragrance revolves around a contrast of noble, subtle ingredients. A classic fragrance made for women, loved by men.